Leicester City players are in Thailand for the funeral of the club's owner, who was killed in a helicopter crash. 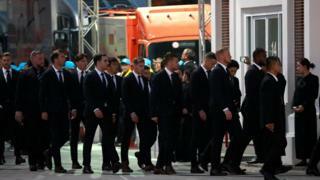 Jamie Vardy and club captain Wes Morgan are among the players who attended a prayer ceremony at a Bangkok temple for Vichai Srivaddhanaprabha's funeral. They joined Sunday's Buddhist prayers for Mr Vichai and will do so again on Monday before arriving back in the UK the following day to prepare for their home match against Burnley on Saturday.